These three classes were closely related saddle tanks initially designed by Stirling for the Great Northern Railway (GNR). The J15 (LNER J54) locomotives were the GNR's first saddle tanks. The J17s (LNER J56) were a smaller version of the J15s; and the J16s (LNER J55) were rebuilt from J15s and J17s with domed boilers by Ivatt. There is often confusion between these three classes due to different boiler re-builds and the mis-classification of a number of locomotives by both the GNR and LNER. A total of 95 J15s (LNER J54s) were built between 1874 and 1892. 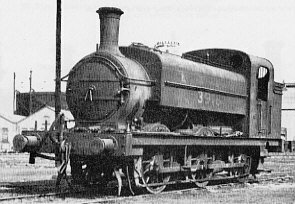 Their boilers, cylinders, and wheel spacings were identical to the existing J6 0-6-0 goods locomotive, but 4ft 8in wheels were fitted. The boiler was 4ft 0.5in diameter and without a dome. Ten J17s (LNER J56s) were built between 1876 and 1877. These were very similar to the J15s but had shorter frames, firebox, and wheelbase. The boiler remained 4ft 0.5in in diameter, and continued the Stirling tradition of being domeless. In 1897, Ivatt rebuilt two J17s with 4ft 5in diameter domed boilers. The wheelbase was also lengthened to match that of the J15s. These two locomotives became Class J16 (LNER J55). No further J17s were rebuilt as J16s, but a large number of J15s were. 28 J15s had been rebuilt by Grouping in 1923, and the LNER rebuilt a further 23 between 1923 and 1933. The LNER further sub-divided Class J54 according to the cab type. Class J54/1 indicated the original Stirling design with open cabs and 4ft 0.5in diameter boilers. Class J54/2 indicated locomotives with enclosed cabs. After Grouping (1923), many of these were fitted with 4ft 2.5in diameter domed boilers. The J54s, J55s, & J56s were allocated throughout the GNR network. By Grouping (1923), the heavier shunting duties had been taken over by the Stirling J53 & Ivatt J52 0-6-0ST shunting locomotives and the West Riding duties had been taken over by the first of the Gresley J50 & J51 0-6-0T locomotives. Hence, they were relegated to lighter shunting duties, and were often allocated to smaller provincial sheds. The withdrawals started as early as 1902. By Grouping (1923), eleven J15s, two J16s, and three J17s had been withdrawn. These were either scrapped or sold. At least one of these locomotives was recorded as surviving until 1956: No. 601A made its way to the NCB Wellesley Colliery, Fife and was eventually scrapped in May 1956. Although the LNER rebuilt many J54s as J55s during the 1920s, withdrawals of all three classes continued during the 1920s and 1930s. Withdrawals were caused by new J50s displacing J52s & J53s which in turn were taking the lighter duties previous undertaken by the J54s, J55s, and J56s. Class J56 became extinct in 1932 with the withdrawal of No. 3608A. A year later, No. 3903 was withdrawn and class J54 became extinct. By 1937, only three J55s remained in service. One of these was scrapped in 1947, leaving two to enter British Railways ownership in 1948. Class J55 finally became extinct in July 1950 with the withdrawal of No. 68319. Pairs of figures for Class J54 are for J54/1 and J54/2 respectively. Cylinders (x2): (inside) 17.5x26in. 17.5x26in. 17.5x26in. Heating Surface: Total: 863 sq.ft. 1119 sq.ft. 857 sq.ft. Firebox: 85 sq.ft. 103 sq.ft. 79 sq.ft. Grate Area: 16 sq.ft. 16.25 sq.ft. 13.8 sq.ft. None of the J54s, J55s, or J56s survived into preservation. I am not aware of any models of the J54s, J55s, or J56s in any scale. Thank you to Malcolm Peirson for the photograph of J56 GNR No. 855.